AshLee Frazier Dating Brad Womack – What Does Emily Maynard Think? 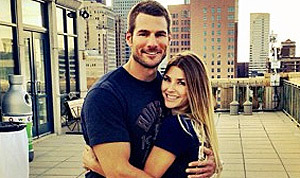 Brad Womack is one lucky former The Bachelor contender. I mean, back in 2007 he dumped both of his final two ladies in a shocking twist, deciding that sometimes being alone is better than hanging with the wrong person. Jump ahead a few years and ABC invited Brad back for another stab at Bachelor success. That time he spent a good chunk of time with Emily Maynard before deciding that they weren’t compatible either. Now Brad his dipped his- something- into the most recent seasons’ dating pool and has decided to give AshLee Frazier a whirl. The brunette failed to win Sean Lowe, the most recent Bachelor’s heart and given all of his recent press it’s probably for the best, at least for her. AshLee took to her instagram account to post pics of her with Brad at a recent Texas Astro’s game. Are you surprised to see these two connecting and dating? Do you think they might actually be compatible or will this be another of Brad’s failed shots at reality television love? These couples so rarely last for more than a few months. Do you think that it’s because they start in a surreal kind of way or is it the same failure rate that every relationship is ultimately facing? Do we just notice it more because these d-listers begin on a reality show about dating and so the pressure to find love is instantly right there? It’s not exactly a natural progression when you have two attractive people put together for the soul purpose of maybe being marriage material! Will Brad and AshLee be the rare success story? I’m betting they can easily out last Sean Lowe and Catherine Giudici! Their showmance is barreling towards a quick ending! Tell us your thoughts in the comments below! Desperate Brad Womack Begs Emily Maynard: Take Me Back!